polled by PT2 every 5 - 10 sec. The ST3 transmitter will allow any sensor or instrument with a 4-20 mA output to be included in an Insite PT2 wireless network. This makes it possible for the readings from those units to be displayed and trended alongside the readings from Insite Model 20 series sensors at the PT2. 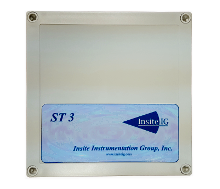 The ST3 provides one input for either a loop-powered (24V) or a non-loop-powered (active) 4-20mA signal. The signal is converted to a digital value in the ST3 and transmitted wirelessly to the PT2. At the PT2, the user may set text values for the sensor’s location and units of measure, as well as the min and max scale factors for the 4-20mA signal. There is also a procedure available at the PT2 for fine-tuning the conversion of the 4-20mA signal. Like the ST2, the ST3 has an outdoor line of sight range of up to 1500 feet. If the PT2 is mounted indoors, the closest ST2 or ST3 should be within 600 feet. The ST3 combines with other ST2’s or ST3’s and the host PT2 to form a ZigBee compliant RF network with self-healing mesh technology ensuring trouble-free communications. This significantly reduces installation costs as there is no need for interconnecting cable or conduit. A rotary switch in the ST3 allows the user to determine which of 15 channels to use. Another rotary switch is used to set the address of the ST3 to one of 16 addresses so that it can be identified within the network. The ST3 has an internal on/off switch.